Today the Getty Research Institute launches the Getty Research PortalTM, an unprecedented resource that will provide broad, free access to digitized texts in the field of art and architectural history. 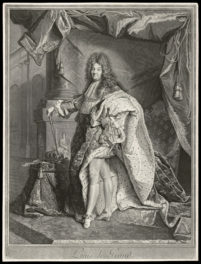 The Getty Research Portal is a free online search gateway that aggregates descriptive metadata of digitized art history texts, with links to fully digitized copies that are free to download. Art historians, curators, students, or anyone who is culturally curious can unearth these valuable sources of research without traveling from place to place to browse the stacks of the world’s art libraries. 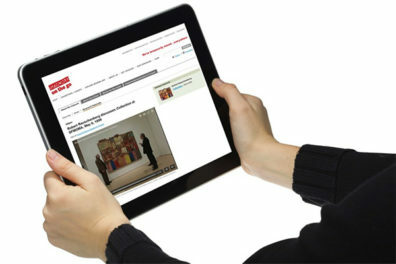 There will be no restrictions to use the Getty Research Portal; all you need is access to the Internet. There are about 20,000 digitized art history texts already included in the Portal, with more to come as more works are digitized and art libraries around the world continue to join the effort. 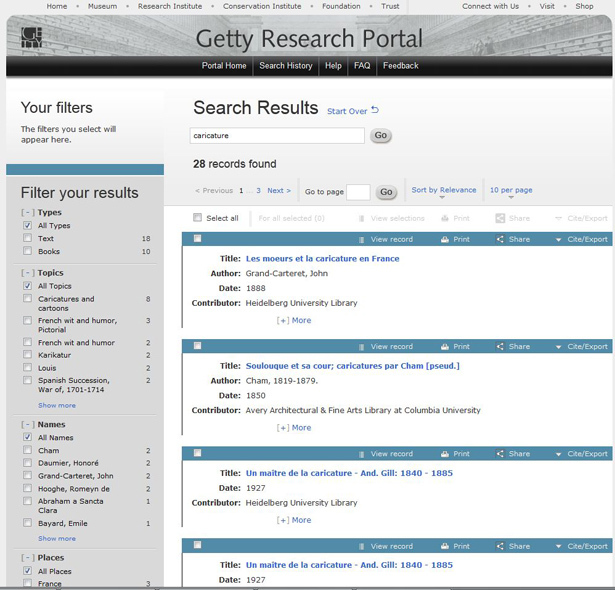 The Research Institute worked with a number of institutions to create the Getty Research Portal—the Avery Architectural and Fine Arts Library at Columbia University, the Frick Art Reference Library, and the Thomas J. Watson Library of the Metropolitan Museum of Art in New York, as well as members of the New York Art Resources Consortium; the Biblioteca de la Universidad de Málaga in Málaga, Spain; the Institut national d’histoire de l’art in Paris; and the Heidelberg University Library. 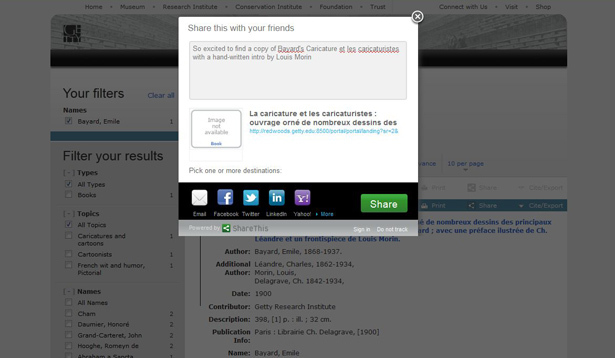 Unlike other methods of searching for books online, every link in the Getty Research Portal leads directly to a complete digital surrogate that is free to download. Let’s say, for example, that you are interested in the art of caricature. 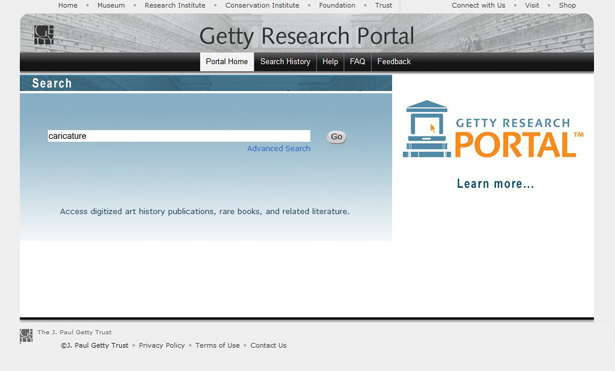 You’d simply go to portal.getty.edu and type the word in the search field. You get a variety of results from around the world. 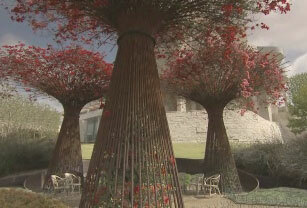 If you’re looking for a 19th-century French perspective, you might hone in on famed illustrator Emile Bayard. In expanding that entry, you can see that the Getty Research Institute has contributed a full digital copy of his La Caricature et les caricaturistes to the Internet Archive. You’d also see a notation that this particular copy features a rare hand-written introduction, with drawings, by artist Jean-Louis Morin. At this point, if you’re as excited as I am, you might even share this discovery with your friends on your favorite social network. 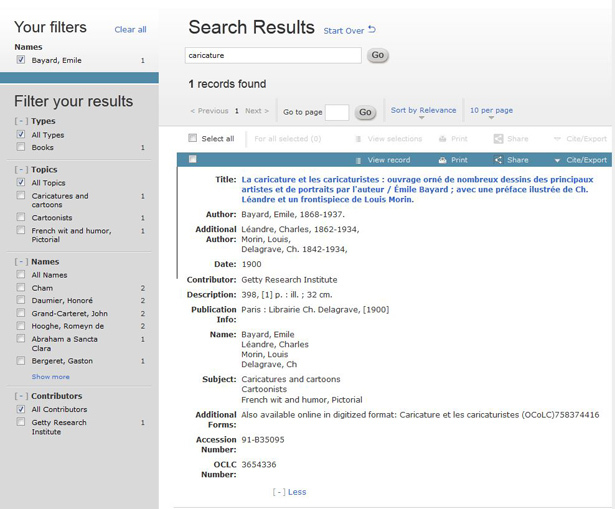 Since the Getty Research Portal aggregates the metadata of each text but doesn’t host the books themselves, the technical possibilities of how many texts can be searched via the Portal are limitless. It also means that once you find your resource and click on it, you leave the Portal to go to the website where the text lives. In this case, Bayard’s book is available on the Internet Archive. From here, you can view the book or download it. The formats available for download vary from library to library, but in every case there is a full, free digital copy of the text available. On the Internet Archive, you can view pages, zoom in on hand-written notes and drawings—and even embed a mini book reader on your blog post. 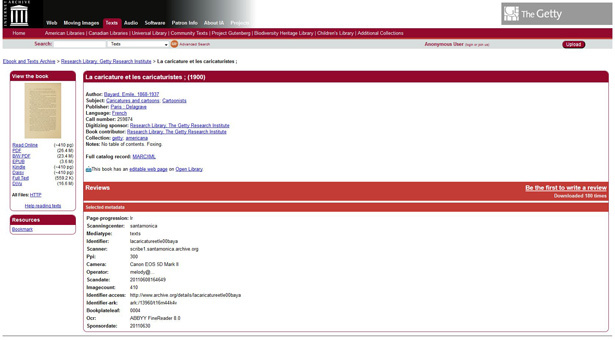 What’s the downside of all of this free online access to the collections of the world’s art libraries? The only one I can think of is that an art historian studying Bayard no longer has an excuse to fly to sunny L.A. to find this rare book in the Getty Research Institute Library. What a great ideal !!! !